Disapproving Bun: Mikey - TGIF Binky! TGIF is for me, for you it's bun chores and 2 days till M*nd*y! Nothing is going to mitigate the joy I am feeling at seeing those binkies. Sorry, Mikey, bunny chores may break my bones, but bunny binkies heal my soul. You're right about extra BunChores for us hoomins at the weekend, Mikey! 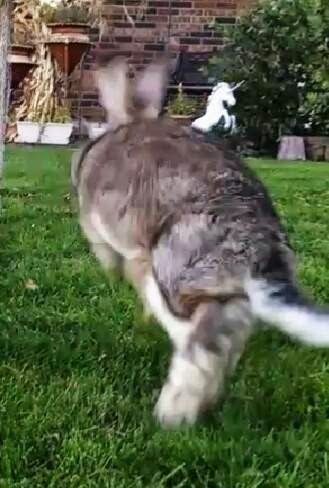 Even I, sadly not owned by anybun, will (hopefully) be doing a few light BunChores for the shelter bunnies, providing nothing goes wrong before then. I Disapprove Of M*nd*ys. Have I mentioned that before? Not sure now. Oh well. I do, anyway. 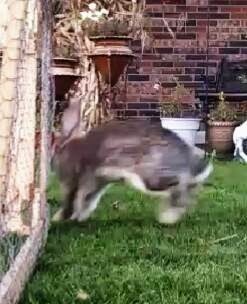 Hoppy Binkying, Mikey! Remember to keep your hoomins busy! This is my very favorite sort of hip hop!